Definition at line 35 of file MCExpr.h. Definition at line 37 of file MCExpr.h. Definition at line 58 of file MCExpr.h. References llvm::HexStyle::Asm, evaluateAsRelocatableImpl(), Fixup, and operator=(). Definition at line 144 of file MCExpr.cpp. Try to evaluate the expression to an absolute value. Res - The absolute value, if evaluation succeeds. Layout - The assembler layout object to use for evaluating symbol values. If not given, then only non-symbolic expressions will be evaluated. Definition at line 453 of file MCExpr.cpp. Referenced by llvm::AArch64InstPrinter::printAlignedLabel(), and llvm::ARMInstPrinter::printOperand(). Definition at line 444 of file MCExpr.cpp. Definition at line 459 of file MCExpr.cpp. Definition at line 463 of file MCExpr.cpp. Definition at line 448 of file MCExpr.cpp. Try to evaluate the expression to a relocatable value, i.e. an expression of the fixed form (a - b + constant). Res - The relocatable value, if evaluation succeeds. Layout - The assembler layout object to use for evaluating values. Fixup - The Fixup object if available. Definition at line 644 of file MCExpr.cpp. Referenced by canGoAfterDWARF(), llvm::CodeViewContext::encodeDefRange(), llvm::RISCVMCExpr::evaluateAsConstant(), llvm::PPCMCExpr::evaluateAsConstant(), llvm::HexagonMCExpr::evaluateAsRelocatableImpl(), llvm::LanaiMCExpr::evaluateAsRelocatableImpl(), llvm::RISCVMCExpr::evaluateAsRelocatableImpl(), llvm::MipsMCExpr::evaluateAsRelocatableImpl(), llvm::PPCMCExpr::evaluateAsRelocatableImpl(), llvm::SparcMCExpr::evaluateAsRelocatableImpl(), llvm::AArch64MCExpr::evaluateAsRelocatableImpl(), llvm::MCAssembler::getAtom(), getLoc(), llvm::RISCVMCExpr::getPCRelHiFixup(), llvm::MachObjectWriter::getSymbolAddress(), incrementLoc(), isOperator(), isShiftedUIntAtAnyPosition(), and llvm::MCAssembler::isThumbFunc(). Definition at line 671 of file MCExpr.cpp. References llvm::MCBinaryExpr::Add, llvm::MCBinaryExpr::And, llvm::MCBinaryExpr::AShr, B, canExpand(), llvm::MCBinaryExpr::Div, llvm::MCBinaryExpr::EQ, evaluateAsRelocatableImpl(), EvaluateSymbolicAdd(), llvm::MCValue::get(), llvm::MCValue::getConstant(), llvm::MCSymbolRefExpr::getKind(), llvm::MCBinaryExpr::getLHS(), llvm::MCUnaryExpr::getOpcode(), llvm::MCBinaryExpr::getOpcode(), llvm::MCBinaryExpr::getRHS(), llvm::MCUnaryExpr::getSubExpr(), llvm::MCValue::getSymA(), llvm::MCValue::getSymB(), llvm::MCSymbolRefExpr::getSymbol(), llvm::MCBinaryExpr::GT, llvm::MCBinaryExpr::GTE, llvm::MCSymbolRefExpr::hasSubsectionsViaSymbols(), llvm::MCBinaryExpr::LAnd, llvm_unreachable, llvm::MCUnaryExpr::LNot, llvm::MCBinaryExpr::LOr, llvm::MCBinaryExpr::LShr, llvm::MCBinaryExpr::LT, llvm::MCBinaryExpr::LTE, llvm::MCUnaryExpr::Minus, llvm::MCBinaryExpr::Mod, llvm::MCBinaryExpr::Mul, llvm::MCBinaryExpr::NE, llvm::MCUnaryExpr::Not, llvm::MCBinaryExpr::Or, llvm::MCUnaryExpr::Plus, llvm::MCBinaryExpr::Shl, llvm::MCBinaryExpr::Sub, llvm::MCSymbolRefExpr::VK_None, and llvm::MCBinaryExpr::Xor. 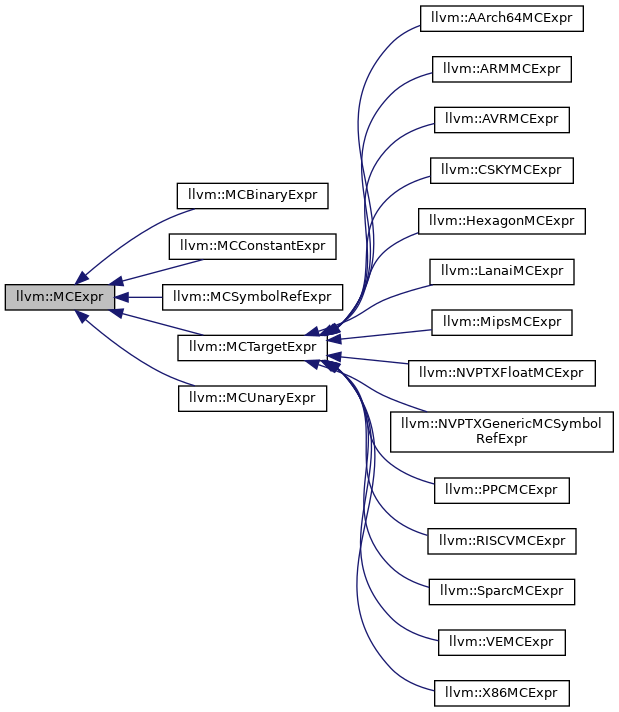 Referenced by evaluateAsRelocatableImpl(), MCExpr(), and llvm::MCTargetExpr::MCTargetExpr(). Try to evaluate the expression to the form (a - b + constant) where neither a nor b are variables. This is a more aggressive variant of evaluateAsRelocatable. The intended use is for when relocations are not available, like the .size directive. Definition at line 652 of file MCExpr.cpp. Referenced by llvm::MCAssembler::computeFragmentSize(), llvm::MCAsmLayout::getBaseSymbol(), getLoc(), llvm::RISCVMCExpr::getPCRelHiFixup(), and getSymbolOffsetImpl(). Definition at line 467 of file MCExpr.cpp. Referenced by llvm::MCAssembler::Finish(), getLoc(), and mergeTypeForSet(). Find the "associated section" for this expression, which is currently defined as the absolute section for constants, or otherwise the section associated with the first defined symbol in the expression. Definition at line 864 of file MCExpr.cpp. References llvm::MCSymbol::AbsolutePseudoFragment, findAssociatedFragment(), llvm::MCSymbol::getFragment(), llvm::MCBinaryExpr::getLHS(), llvm::MCBinaryExpr::getOpcode(), llvm::MCBinaryExpr::getRHS(), llvm::MCSymbolRefExpr::getSymbol(), llvm_unreachable, and llvm::MCBinaryExpr::Sub. Referenced by llvm::HexagonMCExpr::findAssociatedFragment(), llvm::LanaiMCExpr::findAssociatedFragment(), llvm::AVRMCExpr::findAssociatedFragment(), llvm::ARMMCExpr::findAssociatedFragment(), llvm::RISCVMCExpr::findAssociatedFragment(), llvm::MipsMCExpr::findAssociatedFragment(), llvm::PPCMCExpr::findAssociatedFragment(), llvm::SparcMCExpr::findAssociatedFragment(), findAssociatedFragment(), llvm::MCSymbol::getFragment(), getLoc(), llvm::RISCVMCExpr::getPCRelHiFixup(), llvm::MCTargetExpr::inlineAssignedExpr(), and llvm::RISCVAsmBackend::shouldForceRelocation(). Definition at line 72 of file MCExpr.h. Referenced by addNegOperand(), llvm::HexagonMCExpr::classof(), llvm::LanaiMCExpr::classof(), llvm::AVRMCExpr::classof(), llvm::X86MCExpr::classof(), llvm::ARMMCExpr::classof(), llvm::RISCVMCExpr::classof(), llvm::MipsMCExpr::classof(), llvm::NVPTXFloatMCExpr::classof(), llvm::PPCMCExpr::classof(), llvm::SparcMCExpr::classof(), llvm::NVPTXGenericMCSymbolRefExpr::classof(), llvm::MCConstantExpr::classof(), llvm::AArch64MCExpr::classof(), llvm::MCSymbolRefExpr::classof(), llvm::MCUnaryExpr::classof(), llvm::MCBinaryExpr::classof(), llvm::MCTargetExpr::classof(), ConvertDoubleToBytes(), countMCSymbolRefExpr(), createPPCMCAsmInfo(), llvm::MipsTargetELFStreamer::emitAssignment(), llvm::MCELFStreamer::EmitIdent(), llvm::MCObjectStreamer::EmitRelocDirective(), EvaluateCRExpr(), fixELFSymbolsInTLSFixupsImpl(), getAccessVariant(), llvm::MipsMCCodeEmitter::getExprOpValue(), HasConditionalBranch(), hasGOTReference(), HasSecRelSymbolRef(), llvm::MCOperand::isBareSymbolRef(), isOperator(), isPCRel(), llvm::MCParserUtils::isSymbolUsedInExpression(), needsPCRel(), print(), llvm::X86Operand::print(), llvm::ARMMCExpr::printImpl(), RefineErrorLoc(), StartsWithGlobalOffsetTable(), and llvm::MCStreamer::visitUsedExpr(). Definition at line 73 of file MCExpr.h. References dump(), evaluateAsRelocatable(), evaluateAsValue(), evaluateKnownAbsolute(), findAssociatedFragment(), and print(). Referenced by llvm::MCELFStreamer::EmitIdent(), and llvm::MCAsmLayout::getBaseSymbol(). Definition at line 41 of file MCExpr.cpp. References llvm::MCBinaryExpr::Add, llvm::MCBinaryExpr::And, llvm::MCBinaryExpr::AShr, Binary, Constant, llvm::MCBinaryExpr::Div, llvm::StringRef::empty(), llvm::MCBinaryExpr::EQ, getKind(), llvm::MCSymbolRefExpr::getKind(), llvm::MCBinaryExpr::getLHS(), llvm::MCSymbol::getName(), llvm::MCUnaryExpr::getOpcode(), llvm::MCBinaryExpr::getOpcode(), llvm::MCBinaryExpr::getRHS(), llvm::MCUnaryExpr::getSubExpr(), llvm::MCSymbolRefExpr::getSymbol(), llvm::MCBinaryExpr::GT, llvm::MCUnaryExpr::LNot, llvm::MCUnaryExpr::Minus, llvm::MCUnaryExpr::Not, llvm::MCUnaryExpr::Plus, print(), llvm::MCSymbol::print(), llvm::MCSymbolRefExpr::printVariantKind(), SymbolRef, Target, Unary, and llvm::MCSymbolRefExpr::VK_None. Referenced by createPPCMCAsmInfo(), llvm::MCTargetStreamer::emitValue(), GetAEABIUnwindPersonalityName(), getLoc(), getOpenCLAlignment(), getPlatformName(), llvm::operator<<(), print(), llvm::AArch64InstPrinter::printAddSubImm(), llvm::ARMInstPrinter::printAdrLabelOperand(), llvm::AArch64InstPrinter::printAdrpLabel(), llvm::AArch64InstPrinter::printAlignedLabel(), llvm::AArch64InstPrinter::printAMIndexedWB(), PrintCFIEscape(), llvm::LanaiInstPrinter::printHi16AndImmOperand(), llvm::LanaiInstPrinter::printHi16ImmOperand(), llvm::HexagonMCExpr::printImpl(), llvm::LanaiMCExpr::printImpl(), llvm::ARMMCExpr::printImpl(), llvm::RISCVMCExpr::printImpl(), llvm::MipsMCExpr::printImpl(), llvm::PPCMCExpr::printImpl(), llvm::SparcMCExpr::printImpl(), llvm::AArch64MCExpr::printImpl(), llvm::MSP430InstPrinter::printInst(), llvm::AArch64InstPrinter::printInst(), llvm::MipsInstPrinter::printInst(), llvm::R600InstPrinter::printLiteral(), llvm::LanaiInstPrinter::printLo16AndImmOperand(), llvm::LanaiInstPrinter::printMemImmOperand(), llvm::X86ATTInstPrinter::printMemOffset(), llvm::X86IntelInstPrinter::printMemOffset(), printMemoryImmediateOffset(), llvm::X86ATTInstPrinter::printMemReference(), llvm::X86IntelInstPrinter::printMemReference(), llvm::LanaiInstPrinter::printOperand(), llvm::RISCVInstPrinter::printOperand(), llvm::NVPTXInstPrinter::printOperand(), llvm::SystemZInstPrinter::printOperand(), llvm::X86ATTInstPrinter::printOperand(), llvm::X86IntelInstPrinter::printOperand(), llvm::SparcInstPrinter::printOperand(), llvm::WebAssemblyInstPrinter::printOperand(), llvm::PPCInstPrinter::printOperand(), llvm::AArch64InstPrinter::printOperand(), llvm::R600InstPrinter::printOperand(), llvm::X86InstPrinterCommon::printPCRelImm(), PrintQuotedString(), llvm::AMDGPUInstPrinter::printRegOperand(), printSImmOperand(), llvm::MCSectionWasm::PrintSwitchToSection(), llvm::MCSectionELF::PrintSwitchToSection(), llvm::ARMInstPrinter::printThumbLdrLabelOperand(), llvm::X86IntelInstPrinter::printU8Imm(), and llvm::AArch64InstPrinter::printUImm12Offset().